1. 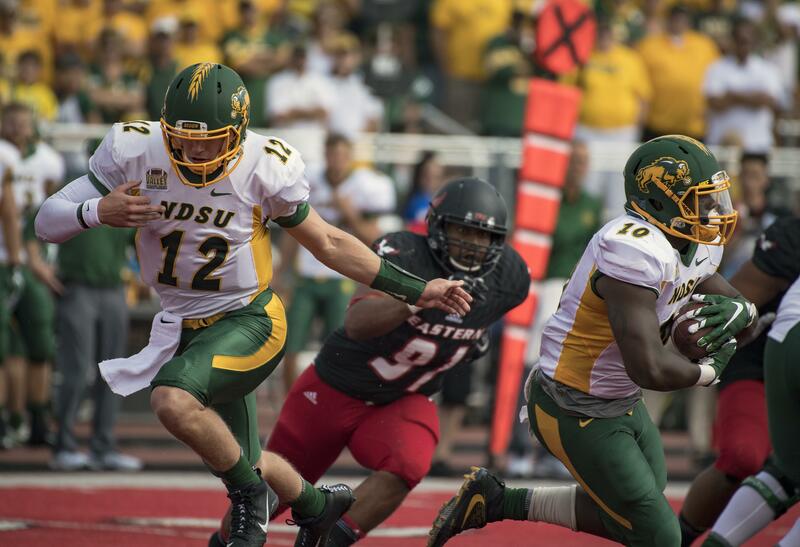 NDSU quarterback Easton Stick and EWU quarterback Eric Barriere had similar starts to their careers. Stick, who is a win away from becoming the winningest QB in FCS history, was thrust into action as a freshman in 2015 when All-American and current Philadelphia Eagles quarterback Carson Wentz went down with a broken wrist in October. Barriere, a sophomore who set a FCS playoff record with seven touchdown passes in a 50-19 semifinal win over Maine, was given the reins in October after All-American Gage Gubrud went down with a season-ending toe injury. 2. EWU won the first national championship game hosted at Frisco, Texas’ Toyota Stadium in 2010, clipping Delaware 20-19 to earn the program’s first FCS title. The Eagles got there after beating North Dakota State 38-31 in overtime in Cheney in the quarterfinals before dispatching Villanova 41-31 in the semifinals. Since NDSU’s playoff loss to EWU, the Bison have gone 101-8, won six of the last seven national titles and are 5-0 against FBS programs, beating Minnesota, Kansas State, Colorado State, Iowa State and Iowa. 3. This year’s FCS title game will be senior-loaded. EWU (27) and NDSU (24) combine for 51 seniors. What is it? Eastern Washington (12-2) of the Big Sky Conference meets North Dakota State (14-0) of the Missouri Valley Conference in the FCS national championship game. Where is it? Toyota Stadium in Frisco, Texas. When is it? Kickoff is 9 a.m. PT on Saturday. Where can I watch it? The game will be aired on ESPN2. Who is favored? NDSU, winners of six of the last seven national titles, is favored by 14.5 points. How did they fare in in the playoffs? In Cheney, EWU downed Nicholls State 42-21 in the second round, UC Davis 34-29 in the quarterfinals and Maine 50-19 in the semifinals. In Fargo, NDSU handled Montana State 52-10 in the second round, Colgate 35-0 in the quarterfinals and South Dakota State 44-21 in the semifinals. Why EWU will win: NSDU has shut down everyone it’s faced (11.8 points allowed per game), but it’s yet to face an offense as dynamic as Eastern’s. Behind dual-threat quarterback Eric Barriere, the Eagles (44.5 ppg) are as menacing on the ground (263 ypg) as they are through the air (277 ypg). EWU’s senior-laden offensive line pushed around two of the country’s top rushing defenses (Maine and Nicholls State) and can give Sam McPherson enough room while keeping Barriere clean. EWU’s defense ranks second in turnovers (32) and may give its offense a game-changing opportunity. Why NDSU will win: It has no glaring weakness. NDSU has a Walter Payton Award finalist, a future pro and a two-time national champion in quarterback Easton Stick; one of the best offensive lines in FCS history; another NFL prospect in running back Bruce Anderson; and arguably the best defense in the country, led by gifted sophomore linebacker Jabril Cox. This is a dynasty for a reason, and the Bison will be looking to send Chris Klieman to Kansas State (he accepted the head coaching job at KSU earlier this month) on a high note. What happened last time? Behind running backs Bruce Anderson and Lance Dunn, NDSU racked up 375 rushing yards in a 40-13 rout of EWU on Sept. 9, 2017 at Roos Field in Cheney. Published: Dec. 30, 2018, 6:50 p.m. Updated: Jan. 3, 2019, 4:03 p.m.